As winter comes to a close in the Northwest, the real estate market is gearing up for another busy spring and summer season. Will it be as hot as 2016? What does it mean for buyers and sellers? Let’s take a look at some telling trends. The above graph represents real estate sales in Washington County, Oregon, from December 2015 through February 2017. 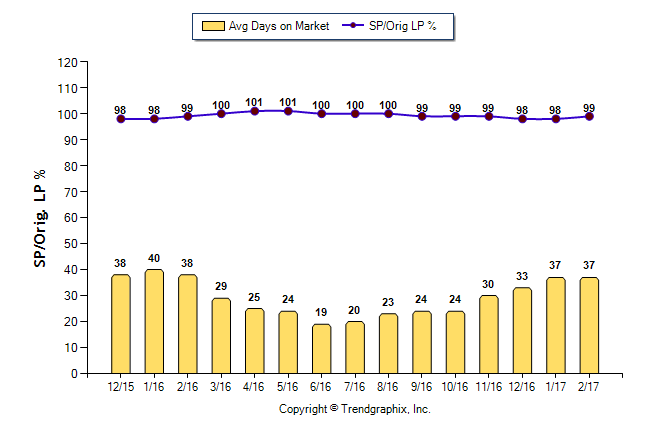 As you can see, the days on market get shorter in the summer months, meaning sales are moving quicker then — but even in the winter months, 33-40 days on the market is not exactly very long. Things are still moving very quickly. The top line indicates the average percentage of sale price vs. original list price. This number has been steady, right around 100%. That means for every house that sells below its asking price, others are selling above. This is great news for sellers — if your home is priced correctly, you probably won’t be waiting long to get offers, and the market is so competitive that buyers will likely be paying the full asking price, if not more, when you close the deal. If it’s good news for sellers, does that mean bad news for buyers? Not necessarily; but buyers must be aware of the current market conditions to avoid frustration and heartbreak. The market is moving FAST. That means you need to stay on top of the listings as they come out. As your Realtor, I check the listings at least once daily, and alert you as soon as something new pops up matching your preferences. If you see something online that interests you, you need to move quickly. Many homes receive offers within their first few days on the market. If you’re not ready to check out a home as soon as it becomes available for sale, it could go pending before you get a chance to see it. What if you’re just not available right away? No problem — I can preview it for you, and communicate with the sellers to let them know you are interested. They may give us some extra time to tour it and get an offer in, or I can write an offer for you before you see it, with everything contingent on your approval once you do get to view the property in person. When it comes time to make your offer, keep in mind that sales are averaging 99% of the asking price. Many sellers receive multiple offers — I’ve seen some with over 20! — so you need to be putting your best offer forward. Do not expect to be able to lowball your offers in a market like this. I’ve had lots of clients say “We’ll start low, and see what they counter-offer.” But what happens is that the seller doesn’t counter-offer at all — they pick from one of the other, better offers they’ve received. Unless the property you are considering has already been on the market for several weeks, you need to plan for a competitive offer situation. Make your best offer from the start. What is the home worth to you? If you lose the contract to someone who offered more, are you going to wish you’d offered more, too? Offer what you are willing to pay. If we find issues during the inspection or appraisal, we can always negotiate fixes or price reductions then. It’s true that buying real estate in the Portland area has become more expensive and more competitive in the last few years. The trends have been steady for the last two years, and there are currently no indications of any major changes ahead. Savvy buyers with savvy agents can negotiate even the toughest market conditions. The key is simply to stay informed. It’s my job to keep you on top of the market conditions and to help you make the best possible real estate deals for you. Contact me today for more information. I look forward to working with you!